In order to use this add-on merchant just needs to have an Aramex account and with all its required details configured. Functionality to calculate real-time shipping rates. The codes are open to further customize. Note: Currently Aramex Shipping Method is not available for domestic services. After downloading the CS-Cart Aramex Shipping Method, you will get a zip file and install.txt. Read the install.txt carefully and configure it accordingly. After successful installation, click on Settings to manage the add-on settings. The Configuration part includes the Product Group (Express or Domestic) Select the desired group and accordingly set the Product Type. Go to Administration -> Shipping & taxes -> Shipping Methods as per the below screenshot. Click on + button to add a new shipping method. 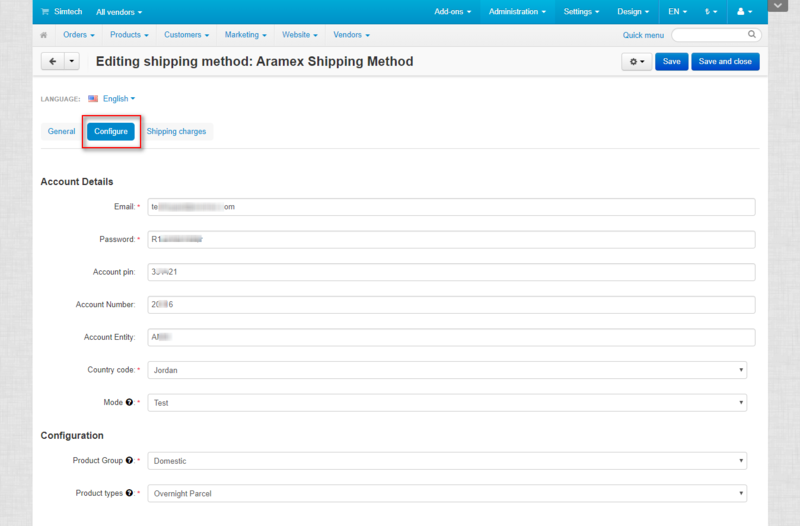 Set the following parameters to add shipping method. Enter the name and description of shipping method. Choose Aramex as a shipping carrier. Set the shipping service as None and fill all the other details accordingly and create shipping method. 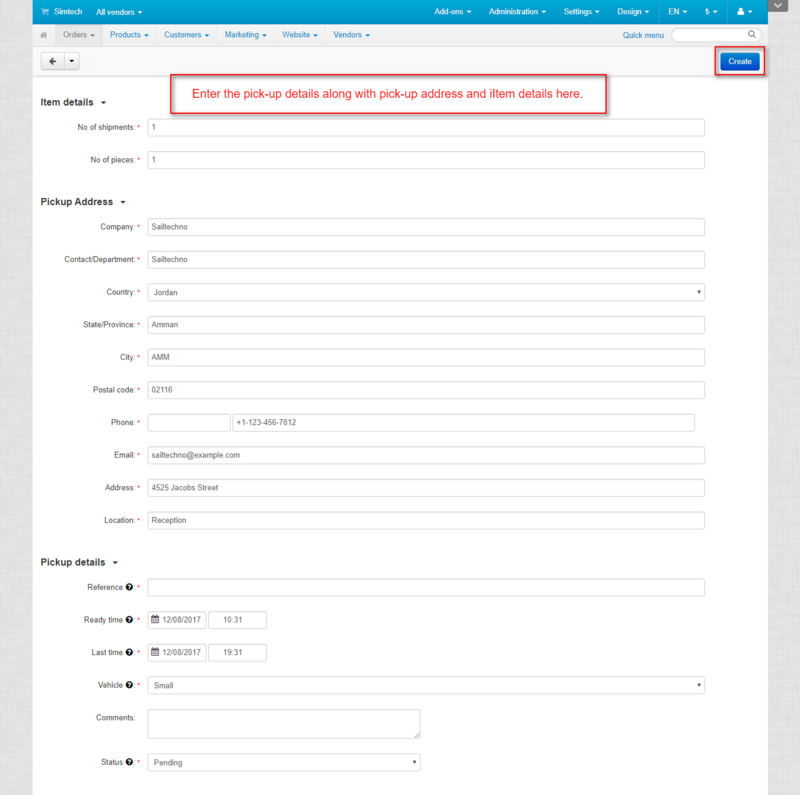 Once the shipping method is created, Click on Configure tab. By default, the values as per the addon settings will be filled. You can update the configuration settings if required. Set the additional shipping charges if required and save. Now user can see the Aramex Shipping Method and its shipping cost on front-end checkout page as per the below screenshot. Select the Aramex shipping method. Choose the Product Type as per the selected Product Group. Enter the global description of this shipment. 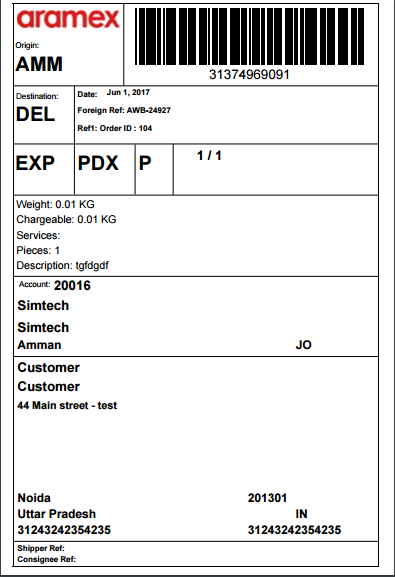 Check the box to Create real-time shipment label generation at Aramex end. Enter the custom charges if applicable. Choose the Aramex as a carrier. Enter the comments for shipment. Set the order status for this shipment. Check the box to send shipment notification to the customer. Once the Shipment is created, Tracking id/URL is generated as shown in the snapshot below. Click on the Shipments and then on Shipment Id to view the shipment details. Click on the gear button on the top right corner or the Shipment Details page and click on Shipping Label. Go to Shipments. Select the desired shipment whose pick-up needs to be created and click on the “Create Pickup“. Enter the pickup information which includes Item Details, Pickup Address, Pickup Details. Enter the number of shipments. Enter the number of pieces. Enter the address from where the items need to be picked up. Enter any general detail the customer would like to add about the shipment in the Reference Section. Set the date Aramex receives the shipment to be shipped out. Set the date specified for shipment to be delivered to the consignee. Select the type of vehicle requested to transport the shipments. Set the pickup status as Pending or Ready as per the requirements. Click on Create button to generate the pickup. All the generated pickups can be seen here. A new pick up can also be generated. 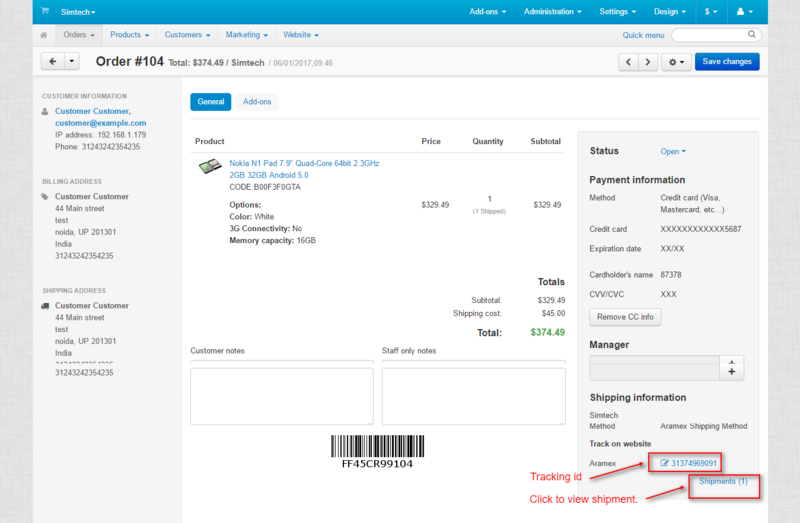 On clicking + button, the Admin/Vendor will get landed to the Shipment list Page. Then they can generate pickup for the desired shipment. There is a feature to use the scheduled pickup for the new shipment creation. If the vendor/admin has created a pickup then he can add the new shipment (Corresponding to any order) in that already scheduled pickup itself. See the below screenshot. Here an additional field “Aramex Pickup” appears if the vendor has already scheduled pickup for any shipment, then he can select the desired pickup from the drop-down. Then there is no need to create any separate pickup for this new shipment. The number of shipments and pieces will get incremented accordingly in that already existing pickup.